An Aberdeen newsagent is believed to have become the first in Scotland to be banned from selling tobacco products. 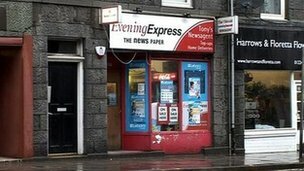 Aberdeen City Council applied for a tobacco retail banning order against Shriraj Gindha, trading as Tony’s Newsagent, in Victoria Road, Torry. The local authority said he had repeatedly been caught selling tobacco products to under age customers. The order, which was granted at Aberdeen Sheriff Court, will be in place for a year. Aberdeen City Council trading standards team leader Graeme Paton said: “Despite numerous advisory visits, repeated warnings and fixed penalty notices, Mr Gindha continued to sell cigarettes to our 16-year-old test purchasing volunteers, never asking for proof of age or their date of birth. “In light of repeated offending, we had little option but to seek an order from the court banning him from selling tobacco products. “This was an extreme case and the majority of tobacco retailers in the city comply with the law. Posted in: Enforcement, Legislation, Tobacco Control, Youth Smoking.